General growing information: If you take care of your tree, water it, keep it mulched, fertilize it when annual shoot growth is less than 12 inches, and protect it from gophers and deer, in about five years you should get a good crop of persimmons. Here in northern California, they begin ripening with the first rains of fall, usually in mid-November. 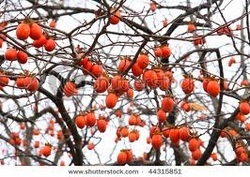 The ‘Fuyu’ persimmons are ready just before Thanksgiving, and the ‘Hachiya’ a couple of weeks later. Location: Full sun with some air movement is recommended for persimmon trees in inland areas, although they will tolerate some partial shade. Persimmons grown in cooler areas should have full sun with protection from cooling breezes. As an attractive ornamental the tree fits well in the landscape. It does not compete well with eucalyptus. Soil: Persimmons can withstand a wide rage of conditions as long as the soil is not overly salty, but does best in deep, well drained loam. A pH range of 6.5 to 7.5 is preferred. The tree has a strong tap root which may mean digging a deeper hole than usual when planting (when on D. kaki stock). Fruit Is on New Growth Remember that the fruit grows on the tree's new growth. Pruning will help stimulate that growth but remember not to get carried away when you prune. Leave 2/3 of the growth on the tree so you will have a more mature healthy tree with better fruit. Medium-large oblate fruit, faintly four-sided. Skin deep orange. Flesh light orange, sweet and mild. Ripens late. Keeps well and is an excellent packer and shipper. Tree vigorous, spreading, productive. Most popular nonastringent cultivar in Japan. Excellent for eating fresh from the tree, does not have the astringent taste of Hachiya. 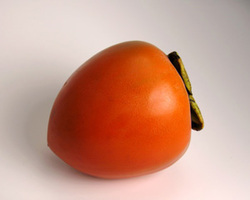 Large, oblong-conical fruit Skin glossy, deep orange. Flesh dark yellow. Sweet and rich. Good for drying and jams. Ripens midseason to late. Tree vigorous, upright-spreading. Prolific in California. Picked when inside flesh has the consistency of jelly otherwise it will taste like a mouth full of chalk. Makes good golf clubs when the tree is cut down. Unless you really love the Hachiya fruit, skip this variety. 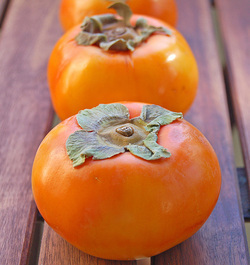 Youtube video chronology of a Fuyu Persimmon from bud to fruit harvest.